After our prolonged blog silence – for which I apologize! – I decided to share with you chronological glimpses of what happened with our GA Local Initiative Program: Sofia, Bulgaria. Just as a reminder, our program revolves around an urban beekeeping project which I, Elena, and my friend Teo have been working on for over a year now. At this time we have wrapped all summer and fall activities and are assessing the results and sustainability options. 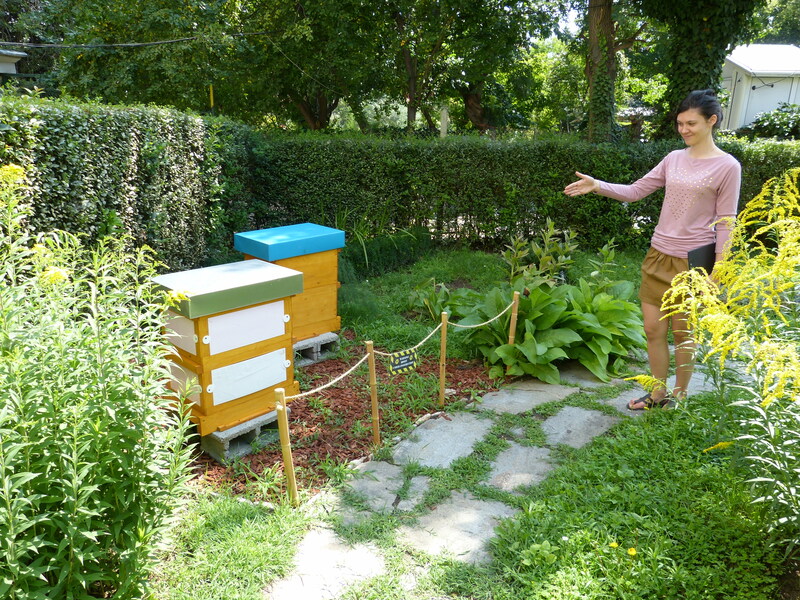 Our first and foremost achievement is the successful and legal installation of two Langstrot Ruth hives and one demonstration hive in the Physical Garden at the very very center of the city. We also managed to lead over So here’s how it all progressed. We leave for Brussels! So, the funding we received for our project came from a contest for sustainable urban development ideas. The contest was conducted in many other European countries including the Czech Republic, Luthuania, Romania, Hungary, Poland. The winning teams were invited by CEE Bankwatch to present their ideas in support for changes in the structure of the EU funding mechanisms that would allow small citizen-lead projects to qualify. People loved our project and we loved the dynamic and vibrant international community. Other projects included urban farms and community gardens, bike-recycling, and many more! Spring here has been moody. We’ve had storms and rain as well as hot summer-like days in Sofia. Despite the construction dust and grime, the linden trees are fully in bloom and the city’s taking some color. Flowers, spices, even vegetables spring up on the balconies around and the parks are all green and lush. While some beekeepers are already harvesting their golden acacia honey, Teo and I have been making slow and heavy strides forward with our project, often barely defeating the usual crooks, the lack of time and money. Last week Teo and I gave a short presentation at a beekeeping seminar. We were invited by Credo Bonum, a foundation that runs the campaign “Of bees and people” and for a second year now organizes a seminar with a focus on beekeeping. Last year we participated as “students” and had a chance to meet many beekeepers and start contemplating on our part. This year, we ended the seminar with a presentation of our project-to-bee and stayed to see the “Queen of the sun”! (Thanks to Lets Go Chicago for recommending it!) We were surprised to see how many people embraced our idea and expressed interest in joining us this summer. Interestingly, people of all ages want to take part and perhaps we need to find a way to plan for more volunteering than expected. A few frustrating months Teo and I spent only talking on and on about beekeeping in the city, reading about the amazing initiatives taking place in urban centers all over the world and fighting to convince beehives producers to sell us two modest hives. It is an impossible struggle to purchase beehives. All Bulgarian producers are overwhelmed with orders – a result of a EU subsidy, and none agree to take our small order. The company which initially agreed, pulled back and left us to wonder in the last minute. 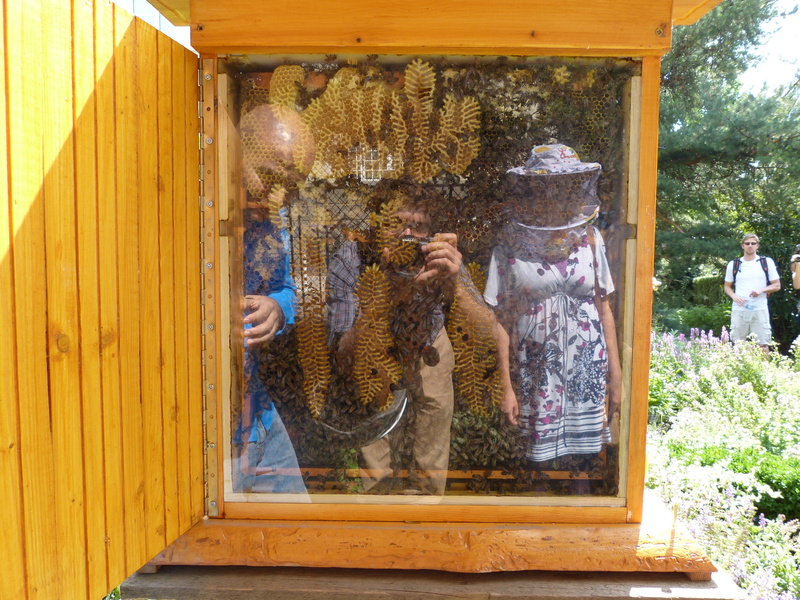 Nevertheless, we met a wonderfully passionate old beekeeper who put us in touch with a producer of a less common for Bulgaria hive – Langstrot Ruth. He was also enthusiastic about the see-through hive idea! In the same time, I was searching for wooden stands and support for the hives, getting the area secure and ready. Here again, we found so much love and support from friends, family and even strangers. Finally, at midnight, they arrived. And the fun began. We organized various events to promote the urban bee center, remembering that we are on a steep learning curve. We welcomed groups of kindergarten kids, school kids, families, friends and many others who contacted us. After a few media hits on the radio and the Bulgarian national TV, we figured its time to create a facebook page. This definitely helped us reach more people and become more organized! Well, I got stung. In the course of our wintering operation I got in the way of the bees and a few of them got trapped in my hair (never forget to tie your hair!, and keep protection on). Needless to say, despite all instructions I gave to all visitors and knowing what to do and not to do, I panicked walked away some distance and then ran! No matter what I did poor fluffy bees could not escape and kept frantically buzzing in my ears. At the end I got a few stings on the head and managed to free a bees as well. That’s it! and of course the bumpy reminder on my head. It is safe to say that our project is not over…….. This entry was posted in Local Programs and tagged Beekeeping, Bees, Brussels, Bulgaria, CEE Bankwatch, Credo Bonum, Sofia by s0luti0naries. Bookmark the permalink.